View of Hudson Yard including the art installation “Vessel”. Source: The Villager. That retailing is being disrupted has become painfully obvious in the last couple of years. In 2017, the phrase “retail apocalypse” was coined to describe legacy retailers closing thousands of stores in the US. This has been usually attributed to the two-pronged attack by Amazon on price and convenience. Other reasons include excessive debt held by retailers and increased competition. In the most pessimistic analysis, the future of the retail store is in serious jeopardy. However, I would argue that ground zero for today’s retail disruption is not simply the retail store and its supposed obsolescence. Instead, ground zero is something subtly different. * It’s called the “order point”, an overlooked and somewhat obscure concept in supply chain management. Thankfully the concept is intuitive enough. Put simply, the order point is when the customer places her order. However, context is key. For the better part of a century, retail has been about managing stores. The art of retail meant timely and relevant merchandising, skillful inventory management, and sales force effectiveness. For decades, the underlying assumption has been that the retail store is the engine for generating and completing orders. Moreover, there didn’t seem to be any compelling reason to critically examine this assumption. Why bother going through the intellectual exercise of separating the order point from stores when stores seem to be the natural space for customers to place orders? Thomas Heatherwick’s Vessel in the center of Hudson Yard’s Public Square. Photo credit: Max Touhey. But we live in a new reality. Call it omnichannel retail, “fluid retail”, “phygital” or your favorite term to describe the multifaceted path of the customer journey today. It’s time to separate the order point from its historical shell, the physical store. Instead, we should think of the order point more as a user configurable space and moment. Once we liberate the order point from its historical confines, the outlines of today’s retail disruption become clearer. The real battle lines in retail are being drawn elsewhere – between mastering (i.e. compressing) the supply chain v. co-opting (i.e. enriching) the customer journey. Amazon has dominated the former but there is less consensus on the winning model for the latter. Let’s talk first about Amazon. It casts a long shadow (or halo depending on your perspective) over the order point, both forwards and backwards. Prior to the order point, the customer journey is focused on research and consideration. Amazon has effectively collapsed this part between research and order point into a virtual catalog and shopping cart. At the same time, it has massively expanded product selection at the warehouse level. Of course, virtual catalogs and shopping carts are foundational to e-commerce and not exclusive to anyone. But Amazon is unusual because it attacks both scale and scope. Whereas traditional retailers took the store to be the primary address of the order point and its adjacent phases, Amazon realized that these phases could be expressed far more efficiently and effectively in a virtual setting. The online shopping cart is the new bottleneck to the order point. This implies thhe best path forward to frictionless shopping is low prices and wide selection. This combination has made Amazon an emerging juggernaut across a swath of product categories from batteries to books. The result has been fairly devastating for retail stores in categories such as basic household consumables where Amazon offers its own private label versions called Amazon Basics, or else sells the same products at extremely competitive prices. Amazon further extends its reach on the smartphone and other connected devices in the home. But we should also not forget another key aspect of the order point forward to the customer, i.e. fulfillment. Amazon holds a second winning card by offering easy, obvious convenience with delivery to your doorstep in hours. Amazon Prime has persuaded many consumers that the need to physically take consignment of the product in a store is actually a defect in the retail experience. Is Amazon the only example of retail disruption? Clearly not. Netflix has applied a similar logic to the entertainment industry by collapsing the supply chain starting from its own B2B order point, namely, green-lighting scripts and production. Any internet enabled screen (i.e. smartphone) can become a consumer-direct gateway to the entertainment industry’s order point. It’s time to wave a long goodbye to the one-to-many broadcasting model of traditional TV and movie theaters. It also goes without saying that this shift clearly has deleterious implications for the traditional advertising model, or at least shifts many of those dollars to on-demand entertainment. It seems that Amazon is poised to conquer all. Do alternative strategies exist for retailing? 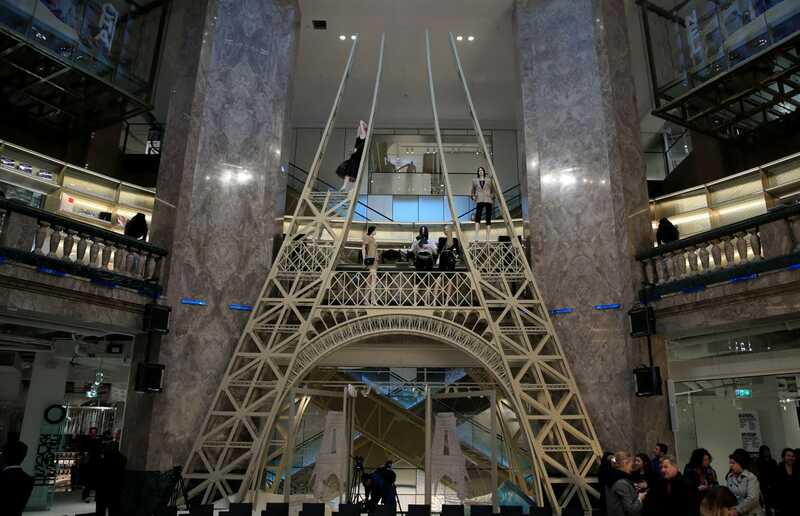 Restaging a Paris landmark within the Galeries Lafayette Champs Elysée store. Source: Business Insider. The Amazon story of disruption is about collapsing the supply chain around the order point, ruthlessly removing friction and inefficiencies that prevent the customer from triggering the order. This type of disruption is accelerated when the buying process is highly purposive, close-ended and acutely funnel-shaped. It also aligns especially well to product categories that are reducible to habit or comparison shopping. Amazon is a powerful model but not the only one. Instead of collapsing and simplifying the customer journey before and after the order point, the alternative requires us to reimagine the order point itself. In other words, how else can customer value be shaped apart from compressing the supply chain? Consider that the best brands enable customers to internalize and express why they are buying what they are buying. This is true for disparate brands like Amazon and Hermes. However, luxury brands like Hermes strike a different, more circuitous path to activating the rationale and motivation to buy. The alternative to Amazon often means employing more dilatory strategies of engagement which embellish, mystify or even obfuscate the order point. This is a pleasurable form of obfuscation for the customer because it heightens her sensory, emotional and cognitive engagement before, during and after the order point. Here the luxury customer opts to ornament the order point for reasons and motivations unrelated to price and convenience. A prominent example of this retail ornamentation is the luxury sector where brands mint a currency of value based on emotion, playfulness, learning, respect or admiration. Traditionally, this currency is cultural in nature relying on myth (e.g. founder’s story), craftsmanship, expertise, cultural heritage, and a sense of history. It also depends on deep-seated social and psychological desires to signal status or individual virtue (i.e. taste). Store as visual merchandise – interior of new Galeries Lafayette Champs Elysee store. Source: Fashion United. The Prussian military theorist Carl von Clausewitz famously wrote that war is the continuation of politics by other means. Similarly, luxury is the continuation of retail by means other than price and convenience. Luxury retail is not a strictly functional, Amazonian logic but an ethos of story gathering and story generation. Hence, luxury brands find ways to arm customers with a stimulating narrative and sensory experience not for its own sake but because it ornaments the time and space around the order point. If done well, this embellishment refreshes the motivational vocabulary and performance repertoire of customers encouraging them return to the brand again and again. It enables customers to successfully justify and/or express the order point as a meta-reward separate from the conventional menu of consumer benefits based on price or convenience. Nowadays this is commonly called “experiential retail”. Let’s look at two examples that just opened last month: the Hudson Yards development in Hell’s Kitchen, New York City, and the new Galeries Lafayette flagship store on the Champs Elysee in Paris. 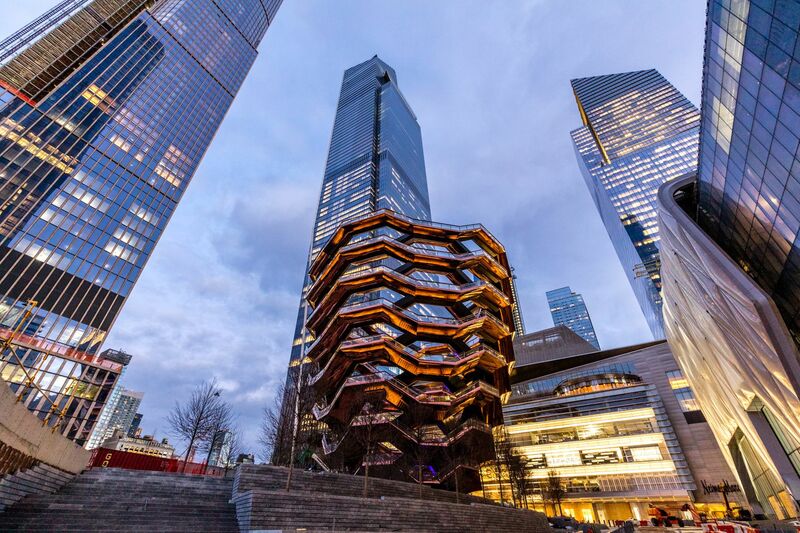 In their master plan for Hudson Yards, the developers deliberately integrated two adjacent cultural spaces – a massive art installation (“Vessel”) and performing arts space (“The Shed”). For brands, these spaces elevate and distinguish the mixed-use space from a typical shopping mall enabling them to associate with contemporary artists and art culture. For shoppers, these provide a performative stage to play the part of cultural connoisseurs or voyeurs. Similarly, the new Galeries Lafayette flagship diverges in significant ways, large and small, from the traditional Parisian department store. In a telling statement, CEO Nicolas Houzé notes that the “whole store is Instagrammable” (WWD, “Galeries Lafayette Unveils New Champs-Elysee Flagship”, March 26, 2019). I should point out there are pros and cons to co-opting architectural landmarks (see my critique of the Fondaco dei Tedeschi in Venice). Even in a world dominated by e-commerce giants, the retail store still has a role to play in the customer journey. Certainly heritage flagship stores remain absolutely relevant. But mainline stores cannot be just a home for sales transactions. Instead, the most compelling physical stores play an integral role in co-opting and enriching the customer journey with brand-consistent diversions, interludes and interventions. On the one hand, stores and their adjacent spaces can provide versatile, multipurpose spaces that encompass cultural discovery and performative cues (e.g. the Instagrammable moment). On the other hand, they can also provide a stage or platform to learn, reflect and feel something above and beyond the quotidian. By now the contrast should be clear. The Amazon approach to retail mastery and disruption is simple but ruthless – remove the veil of mystery around products and services by compressing and simplifying the experience around the order point. In this context, retail apocalypse may not be an exaggeration. The only sane strategy might be following Amazon’s lead and find a way to sell on their platform without diluting other distribution channels. Call it retail compression. The alternative response to today’s retail turbulence is quite different. It’s about reimagining the order point as a special moment in the customer journey. Call this retail ornamentation. Strategically, this means cultivating, differentiating and enriching the space and time around the order point. Tactically, this means mastering an architectural and spatial language that speaks the brand’s voice across diverse geographical markets while constantly finding ways to intensify and diversify the lived experience for new and returning customers. From the C-level to frontline managers, the managerial challenge is balancing these often opposing tendencies in a rational, yet creative way. *I would like to offer my own form of ornamented appreciation to Felix Papier, Andrea Hemetsberger and Delphine Dion. Their classes on supply chain management, consumer behavior and retail management helped plant the seeds and set the stage for this article.